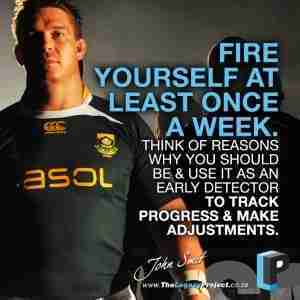 John Smit – Rugby Legend was one of International Rugby’s most successful Captains and players of all time. 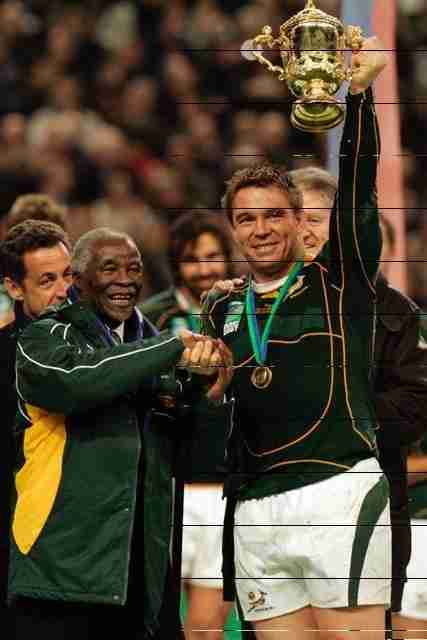 He was the captain of the Springboks, the South African Rugby team (ending his career with 111 Springbok caps), leading the Springboks to World Cup glory in 2007 and was inducted into the IRB Hall of Fame in 2011. After ending his rugby career with Saracens in the UK John took up the position of CEO of Sharks Rugby showing, he is just as good of the field as he was on it. Definition of Success: Success is a highlight, something that you can draw as a picture on a white board. Success is something you measure in time as you go along. My life was measured by success every weekend on a Saturday after every match, John Smit – Rugby Legend knew whether I was successful or not because of the result of the team. Now in this environment it’s very much unlike that although the measurement of success is similar because you try and look at how the company is performing, how the team is going, how the ticket sales are going but your performance is not something that you can actually gauge on a weekly basis purely from a result that is adjudicated by one man. Success is how close and how fast it takes you to get to achieving the goal that you’ve set. In a week as a rugby player, it’s very easy, your goal is to win the game and if you accomplish that then the result is easy to assess. In business, it’s far more difficult, you’ve got to set goals, you’ve got set a process to get there, you’ve got to try make sure that you do not waste time because it’s not something that is judged every single week, so you got to create times where you judge yourself. I am Driven by Success: Whatever I do, I want to leave it in a better state than how I found it. If I’m a part of a team, I want to know that when I leave, the team is in a better position than when I got there. What drives me now is that my time here, when it comes to an end, people can say, “Sherbet, there was a huge amount that happened in this business” and I can leave a positive legacy. Every one of us is driven by the fact that we would like to leave a legacy. The Difference Between good and great: People who are ‘great ‘at what they do are continually driven by the detail and by a passion for implementing their ideas into actual actions (which is a difficult thing). People who are only ‘good’ may have unbelievably great ideas but they just do not know how to close deals and actually action these ideas into becoming a reality. Getting Things Done: If you want something done, give it to someone who is already busy because they have an unbelievable way of managing their time and getting things done without asking other people. Principles I Live by: Honesty, humility, integrity, discipline and you have to have a high work rate as well; these are the things that will make people successful. Lessons I Have Learnt: Be honest in everything that you do, it will make life easier. Telling people not what they want to hear but what they need to hear are key elements of being able to lead in a successful environment. Performing at my Peak: It is important to keep asking yourself the hard questions; When you in a position of leadership, fire yourself at least once a week; (think of reasons why you would be either dropped from the rugby team or fired as the CEO of The Sharks). Think of things you did not do well, judge yourself on a weekly basis to see how you are progressing on with your plan. It can be an early detector of whether you are going off track or not. The Meaning of Life: If you think of your last day on earth and about those who are around you, who have been in your life, (your family, your friends the family you create), the example you set with your life for your kids. You will only really know when you eventually go and see from above, who has actually rocked up at your funeral to say goodbye. 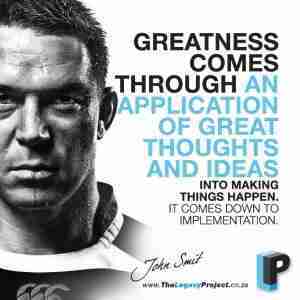 John Smit – Rugby Legend suppose it’s those actions and how you have lead your life that is important to see if you have actually understood the meaning of life.